Goddess Kali symbolically represents the fierce manifestation that Mother Earth can unleash when Adharma spreads on earth. It is impossible to describe or define Kali Mata. In general belief and popular stories, Goddess Kali is the most terrible and malignant form of Goddess Shakti or Durga or Goddess Parvati. Information about Goddess Kali is mainly found in the Puranas and Devi Mahatmya. To better understand Goddess Mahakali today, just multiply ‘n’ times the floods, hurricanes, tornadoes, volcanic eruptions, earthquakes, tsunamis, and other geologic processes human beings have seen. She is the one who nourishes all living beings. She is also one with the power to wipe out the entire universe. To the Devi who abides in all beings in the form of mother. Goddess Kali is also believed to be time that devours everything. Goddess Kali is worshipped independently throughout India. She is widely worshipped in Bengal and eastern parts of India. In South India, she is known as Bhadrakali. When she is Bhadrakali her story is associated with Demon Daruka. 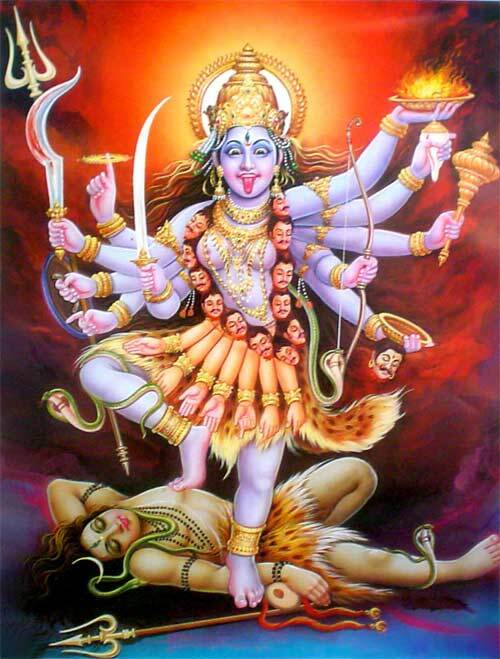 When she is Kali, her story is associated with Raktabija and Mahishasura. The popular belief is that Goddess Kali appeared from the forehead of Goddess Durga while She was fighting demons Chanda and Munda. She is also one of the Dasa Mahavidyas that Goddess Sati created at the infamous Daksha Yajna in which Sati self immolated. 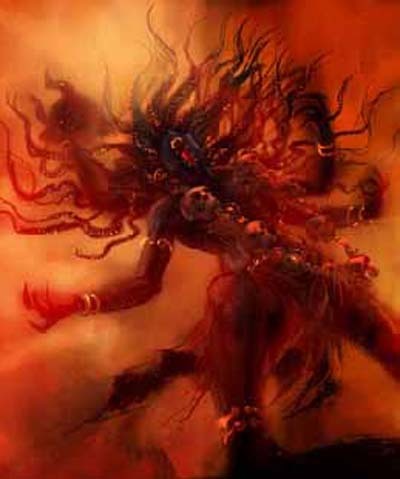 She is the consort of the Mahakala form of Shiva. Goddess Kali is generally depicted as having long ragged hair, fang like teeth, lips smeared with blood and hands with long nails. Her tongue often protrudes. She may be two-armed and there is no end to the number of hands she can have. Commonly she has eight or ten or eighteen arms. She wears a necklace of skulls, belt of severed arms, earrings of corpses and snakes as bracelets. She is dark in complexion. Everything forms and survives in her. In the end, everything is devoured by her like the black hole. She holds a severed head in one of her hands and a large sword in another. She licked up the blood of Demon Raktabija. Each drop of blood that fell on earth could create a million Raktabija. She outwitted Raktabija when she lifted him high into the air to avoid spilling his blood on the ground, and then gnashing him between her teeth, she drank his blood and swallowed him whole. Even after all the demons were annihilated, Mother Kali, who was angered and saddened by the activities of children she nourished, roamed around smashing and slashing. There was no one to stop her. Only Shiva could stop her. He went to the battlefield and lay down motionless among the corpses of demons. The intoxicated Goddess Kali staggered across corpses until, she found herself standing on top of Shiva. When she realized she was touching her husband, she stretched out her tongue in shame and the destruction came to an end. Her temples are spread across India, the most popular one is the Kalighat Temple in Bengal. She is worshipped mainly on Amavasya or no moon day. Main ritual dedicated to her is observed on the Kartik Amavasya, which is popularly observed as Diwali.